Ocelot in deserted Navadra, Mamanucas, W Fiji. Turtle tracks went up the beach to egg laying pits. 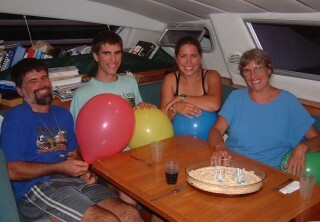 Welcome to the Hacking family website with Sue, Jon, Chris, Amanda, and Arthur (the sea-cat) on Ocelot, our 45 foot Wauquiez catamaran. 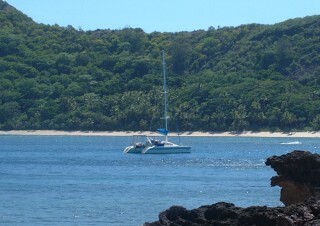 We've been in Fiji since October 2004, after almost five months in the Kingdom of Tonga. Our cruise started in St. Martin in the NE Caribbean in December 2001. From there we headed south down the chain of east Caribbean islands to Venezuela, and then west across the southern Caribbean. We transited the Panama Canal and entered the Pacific Ocean in March, 2003. After a year in French Polynesia, exploring and diving the Tuamotu and Society Islands with many visitors, we set off on our 1,400 mile passage west to Tonga in May 2004, at the end of the South Pacific cyclone season. We enjoyed almost five months in the Kingdom of Tonga, doing lots of racing, partying, whale watching, and getting to know the very friendly local people while waiting for the cruising fleet to arrive. In October 2004 we sailed west to Fiji so Chris could complete his university applications. This took enough time that we decided not to take the leap to New Zealand, 1,200 miles south, when the next cyclone season arrived (November 2004 - April 2005) instead deciding to explore more of Fiji. Check out the Sailing Stats below, for a summary of our first 3 years at sea! We have again decided to extend our voyage for another few years. Our current plan is to head for Vanuatu and New Caledonia at the end of cyclone season before sailing on to Australia towards the end of 2005. But, like most cruisers, our plan is to have no firm plan and to stick to it! Lots of Great New Pages On The Site - Check 'em out! Photo Captions and larger pictures - In general, if you see a caption under a picture, clicking on the picture will bring up a larger version. With 1,400 photos on the site, this is still an evolving process. This update adds more to our underwater section, featuring our many scuba dives in Tonga, as well as lots of our underwater photography of the coral reefs of Tonga and Fiji, and Chris's mini- lectures on underwater photography. It also completes our coverage of the islands of the Kingdom of Tonga, where we spent more than four months, and begins our initial thoughts on Fiji. Our Ocelot section has been completely redone, with more up-to-date pictures and descriptions of the boat. We've even added a new Ocelot Modifications section, to show what we've changed. Jon has added new Cruising Expenses and Frequently Asked Questions pages, as well as more fun stories to his Pre-History series, about our own adventures in the 1980s. 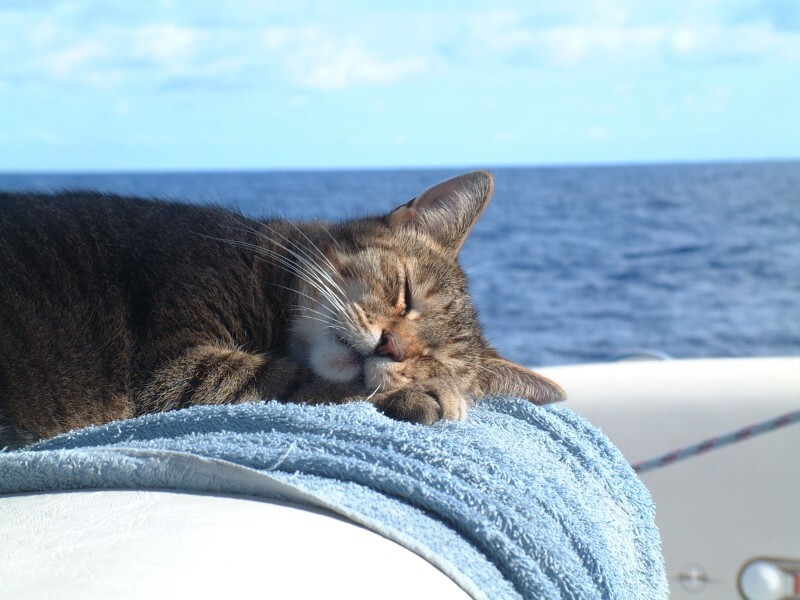 Chris has added a series of his thoughts on the differences between cruising and life ashore. He's also become very adept with the underwater camera, adding a great new how-to section. Amanda has completely redone the Ocelot Layout page and diagram. She's done a fabulous job on the maps. Check out the new one on the Landfalls page. Sue has updated and enhanced her Log, Cruising Cuisine and Recipes sections. 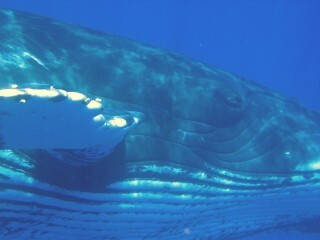 In the Vava'u Group of Tonga we got to snorkel with the Humpback whales and Chris got this shot of the whale's eye. Latest News: During our 4.5 month stay in the Kingdom of Tonga we explored lots of the anchorages of the Vava'u Group, sailed south to the wild Ha'apai Group for a couple weeks, hauled Ocelot out for emergency repairs in Neiafu, and spent many fun days in the town anchorage participating in the yacht races, Friday night parties, and general camaraderie of the cruising life. We did lots of scuba diving and snorkeling, and enjoyed several Tongan feasts and dance shows. 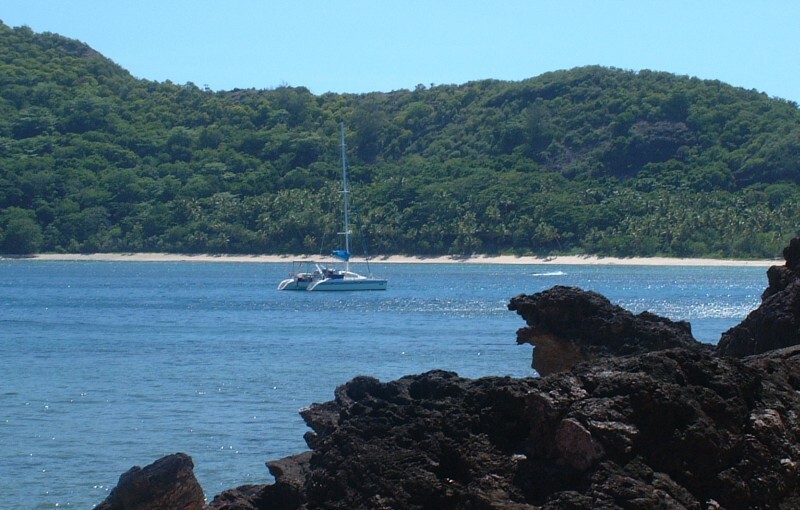 In October 2004 we finally left Tonga for the 3-day sail west through the reefs and islands of eastern Fiji to Suva, the capital, on the southeast corner of Viti Levu. Here Chris could take his SAT university entrance exams as well as submit his applications to 8 different universities. In Suva we found an interesting, bustling city, as well as the first affordable skilled laborers for some time, so we stayed there (with short excursions to see friends or go snorkeling) until Christmas, which we spent with lots of other cruisers in Savusavu. From January through March we've been just about the only cruising boat exploring the western (drier) islands of the Mananucas and Yasawas, doing lots of snorkeling and diving. There are lots of small resort islands our here which are very friendly to us, letting us use their facilities for no charge, so we've also been playing some tennis by day and dancing and singing with the locals at night. On a more personal note, Arthur, our lovable but long-suffering sea-cat, was able to tell us very clearly that he really didn't like it when his world moved, so we've sent him back to live with Jon's father in California. He seems very happy there, despite the resident Pomeranian, and he's promised to email us regularly. The Australians tend to go ballistic at yachts bringing in animals anyway. And although this stricture does not always include teenagers, Christopher has also decided not to risk the Australian's wrath. He'll be starting his studies at the University of Washington, where he plans to major in some aspect of Computer Science and Engineering. The apple didn't fall far from the tree, it seems. We will, of course, miss them both dearly. The only way Arthur likes to sail - fast asleep on the helm seat on a calm day! Old News: Our last update featured our delightful time exploring the Society Islands of Tahiti, Moorea, Huahine, Raiatea & Tahaa, Bora Bora and Maupiti, where we did lots of shelling, snorkeling, scuba diving, and enjoyed our many friends that came to sail and explore with us. The Societies were some of our favorite places in French Polynesia. Because that update occurred soon after buying our digital underwater camera, it also featured a whole new underwater section, including pictures of many of the colorful fish we see, as well as reports on many of our scuba dives. Diving in French Polynesia could get a bit unnerving in that we generally had at least 6 sharks in view at any given time. If you missed earlier editions of the website, don't despair. You can see them out at our Web Archives section, including Amanda's excellent, hand-crafted and hot-spotted maps of all our previous cruising grounds. Basically, we've moved Ocelot 355 (37%) of our 957 days on board. Website Stats: We now have about 425 pages (including 1,500 pictures and maps, and 10,000 hyperlinks) on the site. It takes us 6-8 hours to produce just a single page, so this site represents a lot of work. As of April, 2005 the website is getting about 300 unique visitors a day or almost 7,500 per month! While the majority of these come from the USA, we're also getting a surprising number of hits from all over the world! We're also noticing that about 15% of folks coming to this site are not using IE browsers, and so cannot see the captions we put on our pictures. Therefore, we've started putting our captions below our pictures as well (this is a big job, and therefore an evolving process). Also, clicking on a photo will now often bring up a larger version of that photo (ditto). Comments on these (and other) aspects of the website are always welcome! Which way do sea-fans grow in relation to the dominant currents? What interesting story came out of the wreck of the Clan MacWilliam? Where and why did we have some "high-adrenalin moments" in Tonga? Who was the really good broker we worked with when buying Ocelot? What is 'backscatter' in underwater photography? How and when did Jon & Sue get attacked while underwater? At the La Goelette and Catalina wrecks in Tahiti, by a titan triggerfish. Nesting females can get feisty! Check out the Landfalls pages if you're wondering where we are, where we've been, what we each thought about it, and what the local Flora and Fauna looks like. The Underwater pages showcase our underwater photography and scuba diving. On the Ocelot pages you can see pictures from all over the boat, and read its specifications and our impressions of the boat. On Jon's pages you can read his technical slant on some of the boat systems as well as some of his stories from when we cruised in the 80s. Check out Sue's pages if you want information on the culinary aspect of cruising including recipes, and insight into the cruising life. Chris writes about our inland travels, underwater photography, his projects and schooling. Amanda brings lots of pictures, plus school projects. The Boat Guests pages are designed to make everyone jealous of our visitors and want to come down themselves.